One of the objectives of NILOP is to develop laser based products for different sectors of life like Industry, Medical and Agricultural purposes. Apart from producing lasers which are being used at NILOP. The group has indigenously developed Agro Laser land leveler for better utilization of irrigation water and Laser Therapy System, a module for photodynamic therapy in medical sector for the cure of skin cancer. 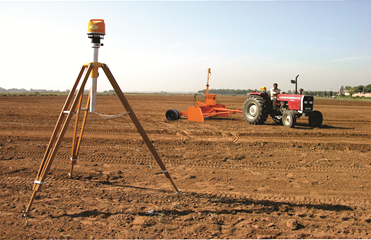 NILOP has produced and sold 1000 Agro Laser Land Leveler. Several Laser Therapy System are being donated to various cancer hospitals for the treatments of skin cancer. Design and development of prototype auto leveler transmitter for Agro Laser Land Leveler. Design and development of �Laser Therapy System� for Photodynamic therapy (PDT) of skin cancer. Development of Low Level Laser Therapy (LLLT) system. Design and development of optical diagnostic system for dengue viral infection.